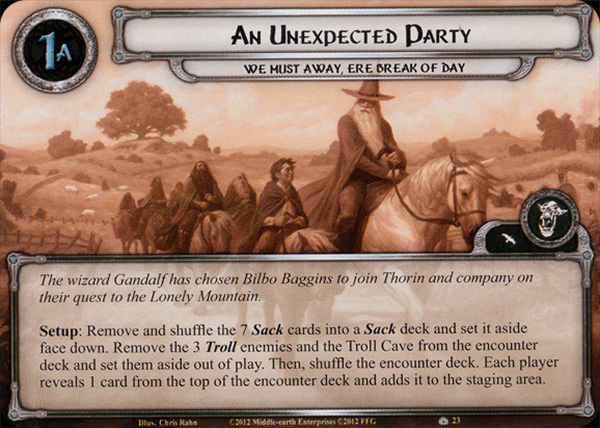 In 2013, Fantasy Flight released its first saga expansion for Lord of the Rings: The Card Game. This was a departure from the normal deluxe expansion followed by a six adventure pack cycle. The saga expansions were designed with taking the player through the actual story of J.R.R. 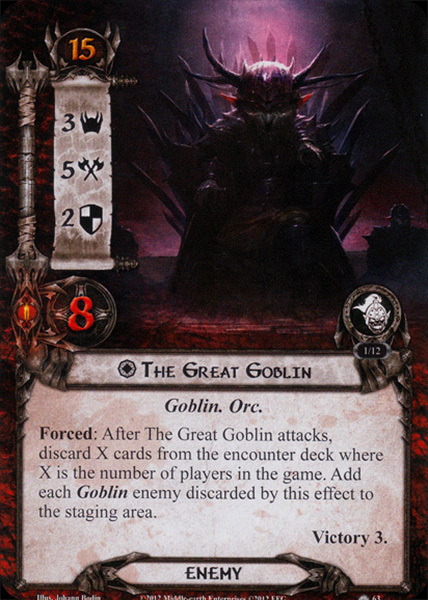 Tolkien’s The Hobbit, and later, The Lord of the Rings, using heroes and cards that best suite the player. Until its publication, players were going on quests, travelling through lands, and battling enemies not directly from the books, but rather inspired by the books. And that was fine for many players. 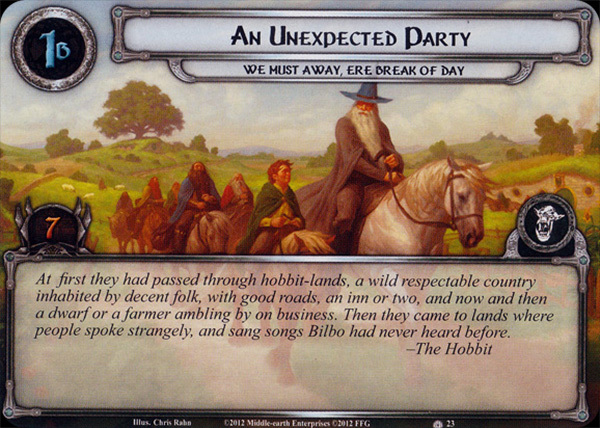 But with the introduction of The Hobbit saga boxes, players are now able to travel the same general path as the band of dwarfs from the book but can succeed without using the actual characters from the book. Imagine taking a band of hobbits with you to Erebor instead of the thirteen dwarfs? Or, how would elves fair if they had to fight The Great Goblin down in Goblin town? All of these possibilities can be explored when you crack open the first saga box, The Hobbit: Over Hill and Under Hill. The first scenario of the box did not disappoint thematically. We Must Away, Ere Break of Day takes its title directly from the lyric of a Dwarf song in the opening chapter of the book. The chapter itself provides the exposition for a reluctant hobbit to go adventuring with a band of seemingly ragtag dwarfs. Much like the first chapter, this, the first scenario, provides the player with an introduction to just how parallel the sagas will be to the book, although most LOTR players won’t be reluctant to play this scenario. 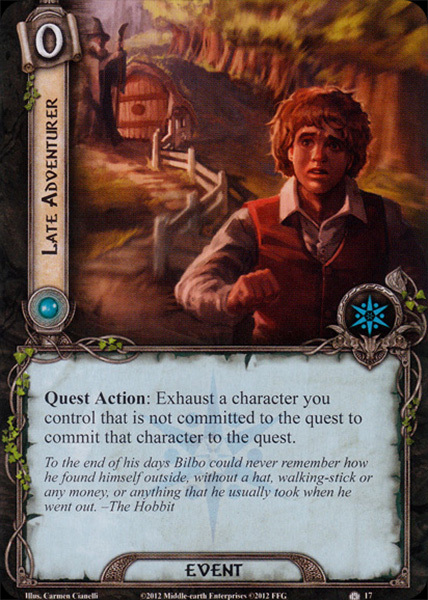 An added bonus for all the saga scenarios is that there is a saga hero, in this case, Bilbo Baggins. These saga heroes do not contribute to your three hero maximum, but sure help the game mirror the books as best they can while still giving the player the freedom to attack each scenario as they see fit. This particular version of Bilbo has its downsides, but in my opinion is by far and away a better hero than the previously printed lore version of the same hobbit. His stats are more well-rounded and he has 3 hit points which is at the top end for a hobbit hero. His game text limits him from gaining resources other than in the good old fashioned way, (he eeeeaaaarrnns them) but that should be the least of your concerns with Bilbo. 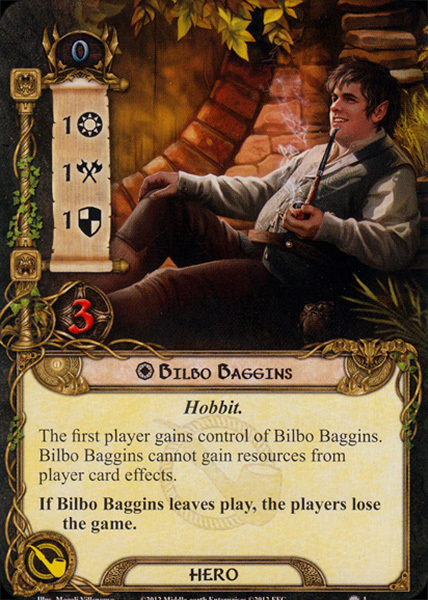 With the introduction of Bilbo Baggins, the hobbit saga hero comes player cards from his sphere, including Burglar Baggins and The Lucky Number. Each of these cards should be considered strongly when building a deck to take on this scenario. Other than spending Baggins resources on speciality cards, the scenario will ask you to spend resources to free yourself from a pretty evil mechanic; getting sacked. Similar to the Sacked! mechanic from Conflict at the Carrock, this version has players getting sacked by card effects and not treacheries. This makes A Test of Will ineffective at solving the Sacked problem (not that you could cancel it in CatC) and requires Bilbo‘s resources to get out of each sack. But don’t think it’ll be easy to collect th e resources and get out of the sack. The game is never that forgiving. You’ll have to first find a Troll Camp, then keep it play, suffer the threat buff to trolls and then try to wriggle your way or help your characters wriggle their way out of the sacks. To compound that, what if you draw More Like a Grocer from the encounter deck and have to discard all your Baggins resources? But, the encounter deck isn’t all bad, right? There are Dreary Hills that lets you recoup Baggins resources and Hobbit Lands which lets you draw a card. This always begs the question though, is the juice worth the squeeze? Is travelling to these locations worth the bonus it provides or is straight up questing the better path? Found in the saga box, Over Hill and Under Hill. There is no official difficulty for any of the saga expansions. There are 3 quest cards. Players should play this quest if they want a story that parallels the first few chapters of the The Hobbit, namely the encounter with the trolls. This scenario seems to run better with two player decks than one but is very playable either way. Definitely try to add some side quests to your decks. The first stage is will allow players to stall a little, allowing them to get a foothold against what is to come. Do remember that every turn you stall, the encounter deck gets smaller. You could refill it with The End Comes if you are running a Dwarf deck. The first quest card finds the player exactly where the book begins, in An Unexpected Party. Unlike the book, there is no real party going on here. 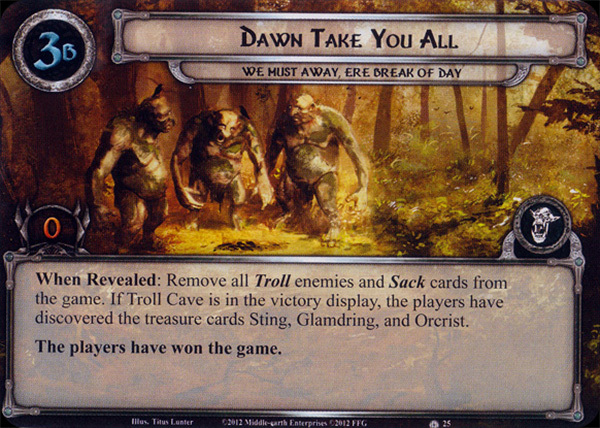 Players are treated to some foreshadowing about upcoming quest cards by having to set aside 7 sack cards to make a sack deck and placing the three trolls and their elusive cave out play. Then each player turns a card from the encounter deck and we are ready to go. The encounter deck is decidedly light on creatures, with only A Suspicious Crow to worry about, but is location and treachery heavy. Locations have a maximum threat of 3 and vary in effects, but in general, can be managed. The treacheries can be murderous, so hope to draw one of the two copies of Wind-Whipped Rain here instead of in the late game. Once setup is complete the game lulls you into a false sense of security by taking you on a no-frills quest stage worth a slightly-less-than-average 7 quest points. But here is the part that can get you. It is so easy to get through this quest card that you’ll find yourself utterly unprepared for the second stage. Take this first stage slowly so that you are ready to tackle the three Trolls that are destined to come out. Precision questing is key here. If you quest too quickly, you will get trampled by the trolls in the next stage. Quest too slowly and you run the risk of losing all your attachments to Wind-Whipped Rain. I found that the best way to be able to time the quest is by using side quests. This gave me the time I needed to stall, while still making some progress. I found that Explore Secret Ways was my go-to side quest because, if I played it right, I could get a Troll Camp to not contribute its 3 threat if one popped off in the encounter deck in the second stage. Another option is to use quest control mechanics with cards like Late Adventurer and Hobbit Pony. Regardless of the strategy you choose, it all comes down to questing with enough willpower to keep your threat low but not enough to get through the stage in one or two turns, or at least until you are ready. Stage two, entitled Roast Mutton, is where the fun begins if you can call it that. The name is taken from the corresponding chapter of the book, where the travellers get caught up with three big, yet no-so-smart, trolls. Just like the book, getting caught is exactly what happens if you aren’t careful after the first stage. To be sure, by careful I mean keep your threat low. Use Elrond’s Counsel if you can or The Galadhrim’s Greeting to keep your threat below 33, or, if you can, below 23. The way this game works, and this scenario is no different, is that you are most likely going to finish stage 1B during the quest phase. That means you will travel and then have to engage enemies upon flipping to stage 2B. The best chances of survival is to have a Troll Camp ready in the staging area to travel to and have a threat lower than the engagement cost of the trolls. The trolls, much like those in Conflict, have global effects that buff each other. The most intense of these buffs is that of Tom. His game text says that you can only attack the trolls with one just character at a time. This means that all that group attacking your used to when killing big bad boss enemies can’t be used until you’ve dispatched with Tom, but by the time you’ve dispatched with Tom you won’t need to group attack. Pro Tip: Try to keep your threat low enough that you can optionally engage Tom first without drawing out Bert, the 23 engagement cost troll. Please refer back to my statement about being careful in putting yourself in a good position for this stage. At this point, the playing surface has turned into an all-out battle with folks getting sacked as trolls get engaged with players and you are trying to quest for enough points to not raise your threat, but also have enough characters left to attack and defend with. As a side note, most sacks cannot target Gandalf, so bringing him (in any form) is a must. 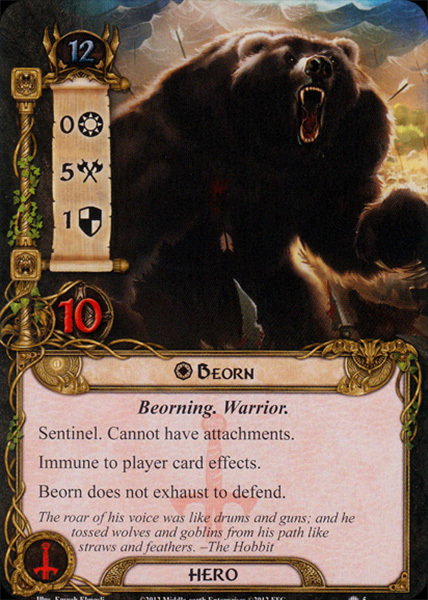 Also, if you find yourself struggling with the sacks, Hero Beorn is an option as he can’t have attachments. Regardless, there are times I’ve played this scenario and it seemed to be bedlam in my head about how to quest, defend, AND attack all in one turn. If the first troll you have to engage is Tom or Bert, no matter. I find killing one isn’t so bad, but the second and third Trolls come out very close to each other, so fending off two while keeping your threat low and deciding whether or not to return the troll to the staging area. . . Oh wait, we haven’t discussed this little mechanic. At the end of every turn, you have to choose whether to stay engaged with the Troll by raising your threat by one or to let him float back into the staging area. This double-edged sword with no good answer and is highly situational. Keep the trolls engaged and have your threat go up by at least 1, or put them back in the staging area and deal with getting sacked? You either rapidly are engaged with all the trolls because of threat vs. engagement cost, or all your characters are sacked and can’t do anything. Neither option is too cheery. My solution? 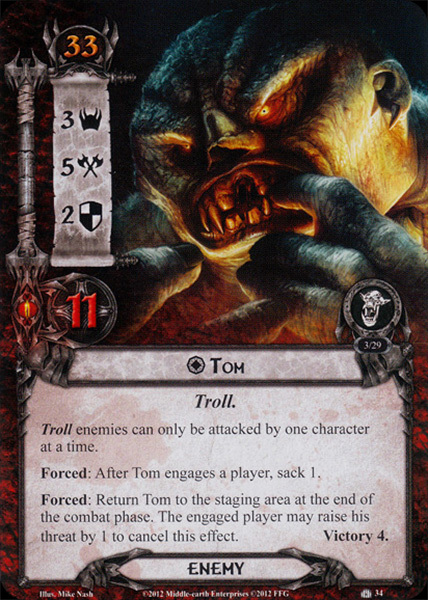 Kill one troll as quickly as you can, preferably in one turn with something, maybe a Sneak Attack/Gandalf or a super buff Merry. Preferably both. I find that once two trolls engaged with you it becomes hard to manage solo. It is easier to manage two trolls with two player decks but is still a challenge. Once you balanced all this action and managed to kill all three trolls, you move on to Stage 3, Dawn Take You All. All the bad guys and the sack cards are removed from the game and you’ve managed to win the game at this stage is merely a placeholder for finding the treasure. Oh, wait… the treasure. We haven’t talked about the treasure. As a secondary quest throughout the main quest, if you are anything like me, you’ll want to win the treasure. I mean heck, who wouldn’t? Especially because it’s Sting, Glamdring, and Orcrist, the three weapons that play out in the book. If the chaos and craziness associated with stage 2B aren’t enough, you should also try to put yourself in position to win the treasure. How can you do that? Dumb luck more than anything. which I imagine is the key to the Troll Cave that was set aside during the initial setup of the game and where all the treasure is. Also, finding the Troll Purse helps to reduce the cost of travelling to the Troll Cave. The problem I had is that the mechanics for finding and obtaining the Troll Key were difficult, at best, to understand. 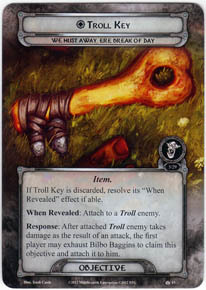 If the Troll Key is used as a shadow card, is it discarded? Yes. It then gets put into the staging area? What if it comes out in stage 1B and there are no troll enemies. 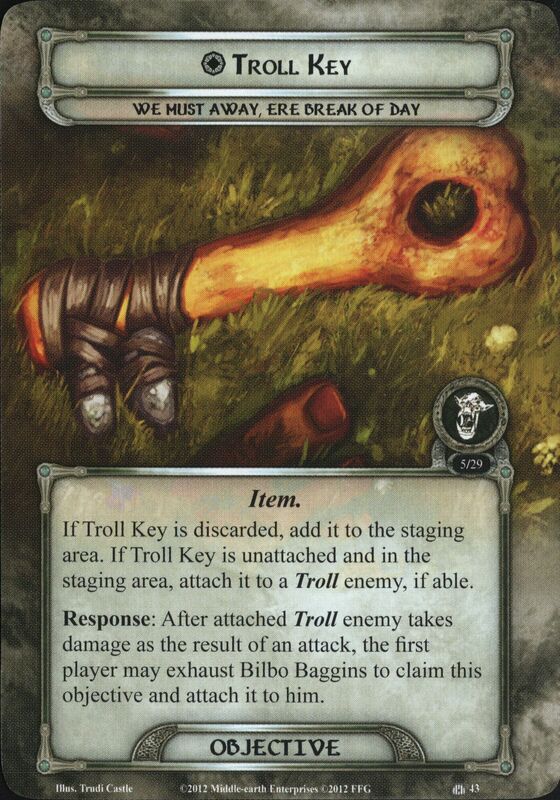 Well, the forums are filled with discussion about the mechanics and the intentions that the designers had for the Troll Key, but the card is so hard to interpret, that even after the game designer weighed in on it, people still argued about it. What happened then? What happens to all cards that are confusing: The errata was published. With the release of version 1.4 of the errata, the Troll Key (and Troll Purse) was clarified to match what the intentions of the game designers. So, for a time, I was stumped but am stumped no longer. All this to say that if you pick up a copy of We Must Away, Ere Break of Day or the Over Hill and Under Hill Saga Box, you may have the pre-errata version of the card which is very confusing. Not that this next piece of advice is unique to this scenario but I’ll say it anyway: have access to the errata and use it first before turning to any forum or message board for advice. It clearly would have saved me some headaches and was a lesson well-learned. The errata lesson was well-learned. But my victory in this scenario, my friends, that was well-earned. To look at one of my winning playthroughs for this scenario using hobbits solo, click this link. The encounter deck contains 32 cards in Normal mode, but only 20 in Easy mode. This does not count the Sack cards or those that get added to the staging area on stage 2A. Shadow effects are on 60% of cards in Normal mode, 66% in Easy mode. A Burning Brand or other shadow cancellation is adviced. Average threat on cards revealed is 0.8 threat/card in both modes, this is extremely low compared to other scenario’s. Surge is only triggered if Hungry Troll has no Troll enemies in the staging area. The small encounter deck will force players to be careful with their questing power. Players might clear the second stage faster than anticipated if they have stalled on stage 1 and drained the encounter deck of cards. Adding new cards with A Nice Pickle, The End Comes or by stalling long enough that the encounter deck runs out of cards on stage 1 will help players to get those Treasures more often. Having a smaller encounter deck in Easy mode will also allow players to find Troll Key and Troll Purse faster. While there is just 1 other enemy besides the Trolls, bringing Thalin to the quest is a great idea. He can take care of any Suspicious Crows for you without its When Revealed effect triggering. This can save you from triggering certain cards twice. Stalling on stage 1 is a good strategy to get your decks up and running, but keep an eye out for the number of cards in the encounter deck. Don’t advance if you only have a couple of cards left and you really want to go for the treasures. Baggins resources are precious, so spending them on cards may not be the best idea if you haven’t got enough to clear the Troll Cave. Only after you have travelled there should you spend them on cards. While Tom is in play, players should have 1 character that can take care of Tom on his own. Dwarf characters are perfect for this, as they can use Khazad! Khazad! and Heavy Stroke to boost their attack strength. Using a single Erebor Battle Master in a Dwarf Swarm deck might also be enough. Treachery cancellation is vital to this scenario as there are quite some effects that can be devastating to your board state. Roast ’em or Boil ’em, Wind-Whipped Rain and More Like A Grocer will all be terrible cards to have to resolve over and over again. Hobbit-Lands only has 1 quest point before it is explored. Having one hero committed to the quest with Warden of Arnor attached will explore the location if it is the first to be revealed. This will not only remove threat from the staging area, but also potentially ready Idraen and provide the first player with a card. 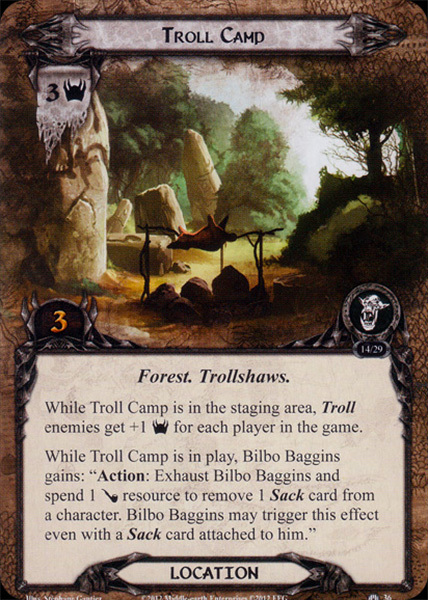 While one Troll Camp is perfect to have in the staging area, any additional copies will just be a burden to the players. Have some location control in play to clear out these locations if you happen to draw multiple copies in the staging area. You could opt to place 2 progress on the first copy to clear it when you reveal another one by having Rhovanion Outrider put some progress on it. You can also clear any copies with Mirkwood Explorer. While engaged, the Trolls are targetable for direct damage effects. Defending with a Gondorian Spearman and/or Spear of the Citadel is already a nice way to reduce the hitpoints on the trolls. Consider using Swift Strike or Gandalf for even more damage.